21½" (54.5 cm) wide and 15" (38 cm) long. 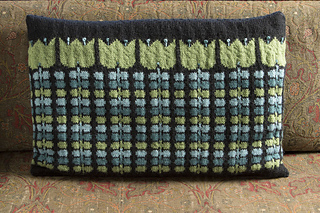 The rows of stylized flowers and leafy sprigs that pattern this cushion were inspired by the wonderfully colorful, and often humorous, eramics and textiles designed in the 1950s and 1960s by Swedish artist Stig Lindberg. 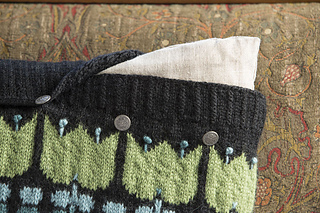 The Stig Sprig Cushion is knitted in the round, and the repetitive nature of the design makes it easy to follow and quick to work. 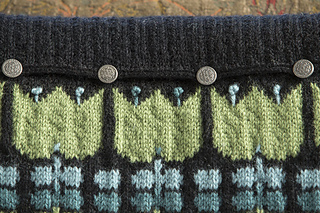 It has a provisional cast-on that is later joined with a three-needle bindoff, and a two-stitch I-cord as a buttonband. Simple mbroidery stitches are used to embellish the flowers. 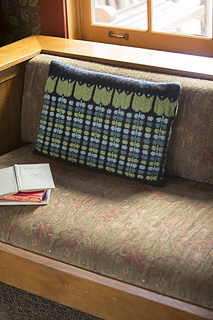 Traditionally, brightly colored, decorative, flat cushions such as the Stig Sprig Cushion were used on chairs, long benches, and in sleighs throughout Scandinavia. I would recommend making your own cushion pad for the Stig Sprig—all you will need to do is cut a piece of linen to the size required, sew up all but a small section of the seams, fill it with pure wool, and sew the remaining seam closed. Needles Size 3 mm (no equivalent; between U.S. sizes 2 and 3) circular (cir) and 2 double-pointed (dpn). Adjust needle size if necessary to obtain the correct gauge. Notions Marker (m); ½ yd (45.5 cm) lining fabric; sewing needle and matching thread; fiberfill; six 5⁄8” (16 mm) buttons; tapestry needle.